Laughlin is a laid-back, country sort of gambling town with rodeos, motorcycle rallies, and really cheap hotel rooms. Laughlin attracts lots of retirees and people who don't care spend a great deal of money on rooms and meals. Laughlin has the river as its greatest asset. You'll love dining at the Prime Rib Room at Don Laughlin's Riverside Casino, where you can enjoy prime rib and other entrees at a very low price, all with a great window on the Colorado River. If you want to try it out, make a reservation or go very early. There are RV parks right in town across from the casinos, places to walk your dog along the river and, not far away, golf courses. Laughlin is in the middle of a desert and it doesn't take more than a few minutes to get out of town. You can walk across the bridge to Arizona (Bullhead City), visit Davis Dam, and picnic by the Colorado River. Laughlin is a nice alternative to Las Vegas for people who don't seek the glitz, glamour, and high prices. Laughlin is located just across the border from Bullhead City, Arizona and is less than a two-hour drive south from Las Vegas, Nevada. Laughlin is more laid back than Las Vegas and much less expensive. There are large casinos and opportunities to attend Las Vegas-type shows, but it is just more relaxed in Laughlin. You can enjoy strolling the river walkway right behind the casinos. 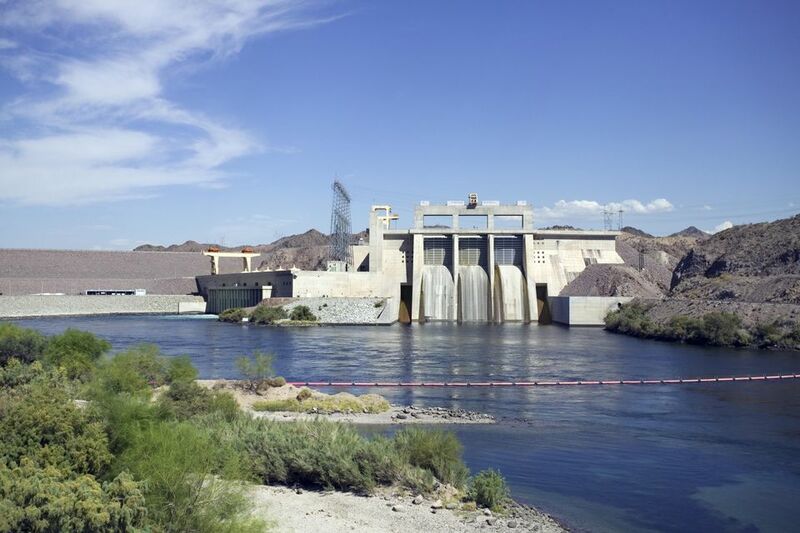 And if you like the water, you can cross over to Bullhead City via water taxi or take your own boat or jet ski out for some exciting times on the Colorado River. Most people head to Laughlin for the gambling. These hotel/casinos are great fun. Laughlin also has motels, RV parks and across the river in Arizona are some great places to camp along the Colorado River. The Laughlin Visitor's Bureau offers a great list of places to stay. Davis Camp, across the river in Bullhead City, is right on the Colorado River. It's a great place to launch your boat or jet ski or sit right on the shore watching the water lap against the beach. Laughlin's current location was originally named South Pointe (southernmost tip of Nevada) and was established in the 1940s. The settlement consisted of a motel and bar that catered to gold and silver miners and Davis Dam construction workers. Davis Dam was built to provide electricity to the Southwest. Once the dam was completed, construction workers left and the motel fell into disrepair. In 1964, Don Laughlin, owner of Las Vegas' 101 Club, bought the property. He developed the Riverside Resort and South Pointe was renamed Laughlin. What Really Happens in Area 51?